Goodbye grey skies, hello blue! Happy days are here again with Richie, Potsie, Ralph Malph and the unforgettable “king of cool” Arthur (The Fonz) Fonzarelli. 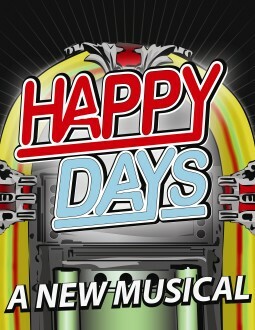 Based on the hit Paramount Pictures television series, Happy Days – A New Musical reintroduces one of America’s best loved families, the Cunninghams — yes, Howard, Marion and Joanie are here too — to a whole new generation of kids and parents. The famed drive-in malt shop and number one hangout, Arnold’s, is in danger of demolition. So the gang teams up to save it with a dance contest and a TV-worthy wrestling match. Even Pinky Tuscadero, Fonzie’s childhood sweetheart, returns to help – will they rekindle the old flame?